I have never really liked it when someone tells me "time flies by" in regards to the Baby. It's just an overused statement. But it's painstakingly true. We are fast approaching the Baby's one year birthday. The Wifey, for the first time ever, has finished making the invitations and mailed them off in a timely manner. She made them herself (with a little help from friends) but I am really proud of her. Although I do disagree with the schematics and realism of the invitation, it is a very cute and novel idea. And with the Baby's first birthday, we are deciding what to give her as her gift. Luckily because of our laziness of never removing her Christmas toys from the trunk of the car, she has a steady stable of new toys to enjoy. And with credit to her very generous and fashionable grandmother, the Baby has a large wardrobe that extends multiple seasons. But I think we found the perfect gift in the form of cardboard. I received a nice singing card for my birthday, the one where you open up the card and get blasted with some crappy, overplayed, white trash song like Bad to the Bone or Achy Breaky Heart. Fortunately my card had a Men's A-capella group singing happy birthday so I was pleased. But the Baby got a hold of the card and she absolutely loved it. She figured out how to open and close the card over and over again to piss off parents. So now every time we head to the store we go through all the singing cards to find another good one to add to the Baby's collection. Another example on how "time is flying by" (ugh) is the Baby's progression with walking. Last Monday she was barely taking steps and two days later she was practically skipping across the kitchen tile. Skipping might be a gross exaggeration. In order to get a better physical, the Baby's first steps are more like when Forrest Gump was a kid and he was gyrating around in his braces but it doesn't matter how she is walking, she is walking now. If I really think about it, it's pretty creepy that she is walking now. Don't get me wrong, she is the cutest baby on Earth but the fact that she is still relatively tiny makes her a creepy walker. 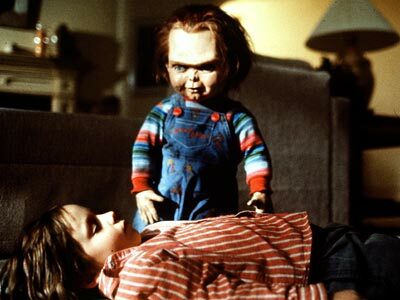 Whenever she gets on her feet and slowly steps her away towards you, she reminds me of Chucky from Child's Play. She even looks like him with her thin hair. Yikes.